Home » News » Uncategorized » Why not adopt a disabled pet? Why not adopt a disabled pet? I did not plan to write a column about animals with disabilities this week. 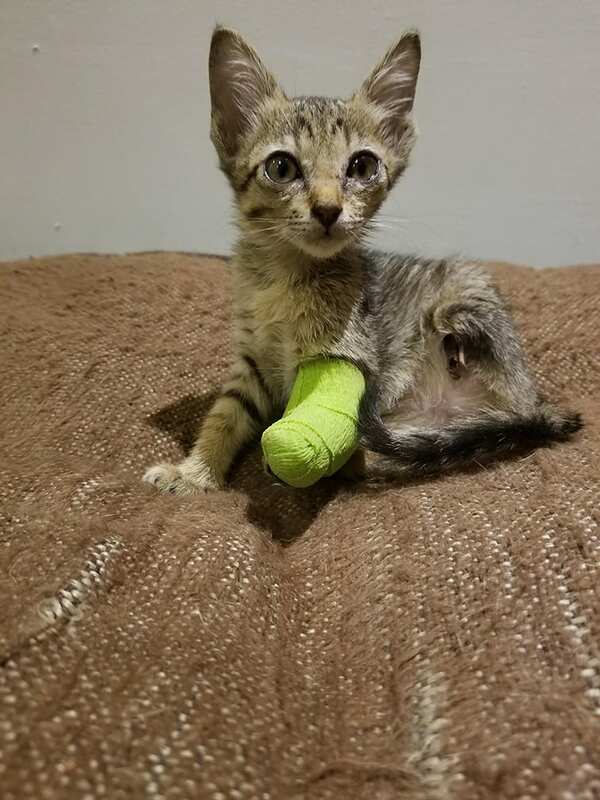 Yet, given the latest rescue kitten brought to us few days ago – with both of his left (front and back) legs missing and the naked bones protruding out where the paws should have been, I feel I must discuss why we should not be afraid to welcome a disabled pet into our family. I have seen and have few pets, both cats and dogs with various physical disabilities. Two of my dogs, Angie and HeiHei are completely blind. HeiHei is also deaf. We have Lindy who was hit by a truck and lost the function of her back legs. We have a cat who had all his teeth removed due to severe stomatitis. Sounds gruesome, right? And it all seems like a lot of work, too, right? If you had spent time with animals with any disability you know: none of them either care (or even know) about what does not work in their body, as long as it is pain free. The animal goes about playing and living its life to the fullest. In fact, for all of us at Animal Mama these animals are constant reminder that suffering is relative – that appreciating life and all it has to offer is not difficult if you concentrate on what you have, and not on what you are missing. Blind dogs and cats adapt to their lack of sight rather quickly. Whether is it born or acquired condition is of little relevance. Although, they might be a little clumsy or bump into things occasionally, as soon as they are comfortable in their new home, you would never know they are blind. Recently, we rescued a kitten with severe eye infections and his eyes had to be removed to save his life. The family that adopted him told us later that they were all shocked at how precise, playful and happy this kitten turned out to be and how he navigated the entire house with two floors as if he had full eyesight at his disposal. Till today, he climbs, jumps, runs to his litter and food without making any mistakes. The family told us that they often forget the kitten has no eyes. Dogs, from my experience, take a bit longer to get used to the loss of sight, but as long as they live in an environment where furniture, their food and water bowl and bed is kept in the same place, they can easily navigate the home using their noses. To be entirely safe it advisable to pad any super sharp edges, although I have never seen a blind dog run too fast anyway, and never to the point of injury – they are careful while walking and even if they do bump into things, it is never at high speed. So serious injuries are rare. The only thing to remember are cars and open roads – therefore never take a blind dog outside off-leash. Another thing to remember: dogs and cats memorize their paths through the house. So, if you decide to carry your blind animal from one floor to the next, or from the kitchen to the bedroom regularly, you may be doing them a huge disfavour. It can actually leave them disoriented – unless it is a house they know very well. So let them figure out the house on their own, it will be safer for them on a long-term. When animals lose their hearing it can be distressing, but again, animals are resilient creatures and are very good at adapting to their disability, often making it into the “different ability” instead. For deaf dogs and cats, they would become very visual and be experts at reading your facial and body language. They also become ultra-sensitive to vibrations in the environment. So, having a deaf animal is often like having a pet with four eyes and a sixth sense. Finally, the animals that are missing limbs are the ones that truly surprise and astound me the most with their super ability to adjust and move around as if this is a natural state of their body. Some can even do more than their four-legged friends! We had a three-legged puppy that ran so fast, she could outrun her healthy adult bodies in our daycare program. She played fetch, stood her ground when challenged over her toy by other dogs and was otherwise a normal sweet and agile pup. For the dogs with two limbs missing or not working, there are many choices of wheelchairs, which they learn to use quickly, and ultimately love and use with pleasure. Lindy, our two-legged dog uses her specially designed wheel chair with such passion and reaches such speeds, that other dogs are a little jealous of her “super-ability” (or so I suspect). 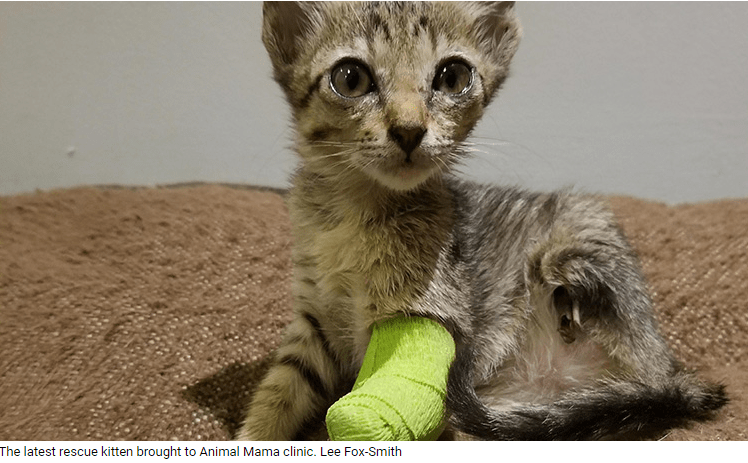 Having an eight-week old kitten with only two legs at our rescue center makes all of us wonder about animals’ resilience, strength and passion for life. Despite having only two legs, he walks, uses the litter box, and walks to his food and water bowls. And what is more extraordinary – the other cats accepted him immediately as if they knew he needed more time and space, and when he came to the food bowl – they all stood back waiting for him to finish his meal. It was amazing to witness! Having had many disabled animals, I can personally vouch – together with many other owners of differently-abled pets, that they are incredibly loving, gentle and a true inspiration to be around. Trust me, most of the time their disability does not mean that the pet would be harder to care for or less cuddly and lovable. So, please do not be fooled by their apparent disability – you will be pleasantly surprised to discover how perfect your home will become when an “imperfect” pet becomes part of your furry family.